Spotify’s digital music service has 24 million users and six million subscribers. But it wants a lot more. So it’s advertising on the Web’s most popular music service: Starting tonight, Spotify is running a one-day “takeover” ad on YouTube’s homepage, which you should be able to see now. 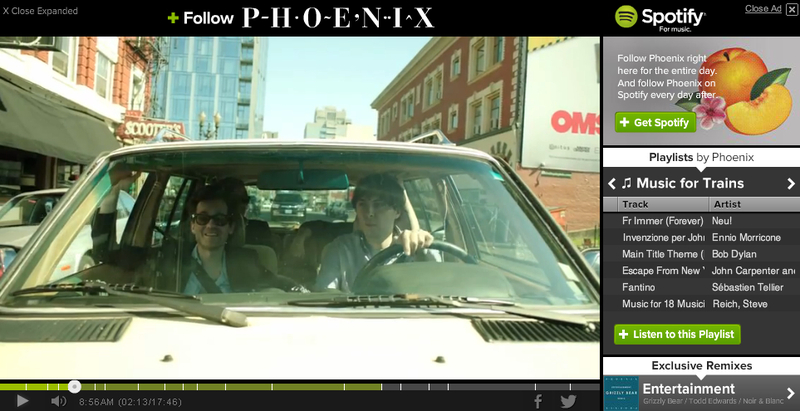 The spot, as Spotify folks describe it, sounds pretty clever: The idea is that fans are supposed to “follow” the band Phoenix for a day, via an 18-minute documentary that will roll out in pieces, in what’s supposed to mimic real time. That is — if you click on the videos early Tuesday morning, you’ll only see a few minutes of clips, but you’ll see more in the afternoon, and the whole thing by the end of the day. The “follow” idea is also supposed to remind you that Spotify has introduced a Twitter-like discovery metaphor/feature, so you can see what your friends, or famous people, are listening to. The bigger picture is that Spotify, which has grown quickly in the last few years, needs to get much bigger to satisfy investor and management ambitions. Lots of digitally savvy people still don’t understand what the service is, or how it differs from rivals like Pandora or iTunes; plenty of normals simply haven’t heard about it, period. Hence Spotify’s first real TV ad campaign, which launched last month with big-budget buys on broadcast TV shows. The YouTube homepage isn’t cheap, either — it reportedly costs $400,000 a day. But what about the fact that Spotify CEO Daniel Ek has long argued that YouTube, which offers an unlimited supply of music, for free, is his biggest competition? And that one day, perhaps this year, Spotify may be competing with YouTube when it comes to a paid subscription service? Isn’t this a little like Fox taking out an ad for “American Idol” on NBC’s “The Voice”?